If you're on Facebook, you're probably more than aware of the changes that took place over yesterday (and strangely, the changes were present for some users for the past few weeks although no one I know recalls signing up for beta testing. But I digress.) You've also probably had it up to HERE with people talking about it, so I apologise for this post in advance. The day started with a lot of "WTF Facebook?!" statuses in my feed, progressing to expressions of anger and/or general annoyance. 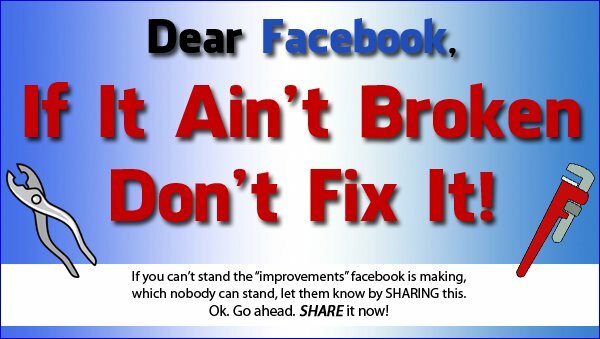 By the end of the day, dozens of graphics about Facebook made the rounds, clearly dividing those who were fed up and those who were fed up with all the people who were fed up. I was on the side of "WTF Facebook?!" as I struggled to understand the new layout and features. I wasn't bothered by the concept of change, it's the fact that the change was unannounced, seemingly without any user input (or consultation with anyone in the UI design industry), unintuitive, lacking in documentation, and largely unconfigurable. It simply made little sense. Having used it for a day now, I think I'm familiar with all the new stuff and slightly less vexed by it. I just have to be more mindful about commenting on anything (I now check that the privacy setting is set to "Friends of x" to avoid spamming the feed more than necessary) and I've enjoyed being taunted in the live ticker, thanks to crafty friends who realised that comments they post on certain friends' walls would show up in the feed. I understand that comments on "Public" and "Friends of friends" statuses and photos were always visible on your wall (not in your feed, as far as I can remember), but you could hide this activity and it would never appear on your wall. Now these actions are displayed in the ticker, and you can't do squat about it. Furthermore, I cannot get my head around the incredibly vague and seemingly random classification of subscription updates - what are "most" and "only important" updates? What parameter are they using to determine these categories, and how are we supposed to know what they are? From what I can gather, you need to go to every friends' profile page and select "All updates" to see everything they post. Otherwise, you get a lucky dip assortment of statuses that some bit of code has deemed feedworthy. No, really. The only documentation I've seen regarding the new changes is this rather terse page here: http://www.facebook.com/help?page=189712557768134 that doesn't really tell you how to do anything terribly useful. A friend posted a link to this video, which is far more informative (and not produced by a Facebook employee): http://www.facebook.com/photo.php?v=1989051093764 This morning I saw a link on Mashable about further, rather ominous sounding changes brewing ahead for today. Fabulous. Unleash more amusing graphics! At the end of the day, after the ten millionth status complaining about the new Facebook, the statuses and images telling us to stop our bellyaching began to fill up everyone's feeds (or on a less angry level, many people simply didn't understand what the fuss was about.) For me, the fuss was about rolling out a UI that's confusing with a lot of important issues that users aren't aware of. 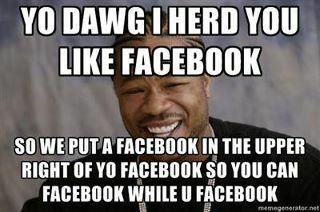 Facebook is free to use, but we are still their customers and without us, they don't generate revenue. With hot competition from sites like Google+, it's in their best interest to keep their users happy and to actually listen to user feedback. 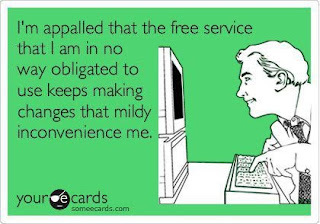 In the larger scheme of things, changes to Facebook aren't going to ruin my life. But I think there's no excuse for being arrogant and lazy in the business world, and this is what I've been vocal about. Usability is a fundamental part of any web site, regardless of whether or not your visitors are paying customers. Write some docs, add some tool tips and online help, and I'll be a little more forgiving, Facebook.